Damn, VIZ always have the most enthusiastic reps at these cons. Did an hour of power on exhibit floor, now sitting in the Viz panel at #NYAF. Another Viz announcement: Toriko, “cross between Iron Chef and Land of the Lost,” debuts in Feb. issue of SJ, vol. 1 out in June. New Viz Signature title, Gente, by Natsume Ono, followup to Ristorante Paradiso, due out July 2010. Inu Yasha anime simulcast announced. They announced the Rin-ne manga, I believe first volume out in October. Missed part of that because I was swearing at the computer. On the train listening to some AKB48 in preparation for the concert. Got into the concert! Standing room only. My feet are gonna kill me. They gave us glow sticks while going in. AKB48 PUT ON AN A-M-A-Z-I-N-G SHOW!!!! THANK YOU #NYAF FOR THE ONCE IN A LIFETIME OPPORTUNITY!!! AKB48 was by far the highlight of the con. So amazing. They even did TWO ENCORES!!! I took tons of photos. They didn’t come out so great but some came out good. WILL POST SOON!! 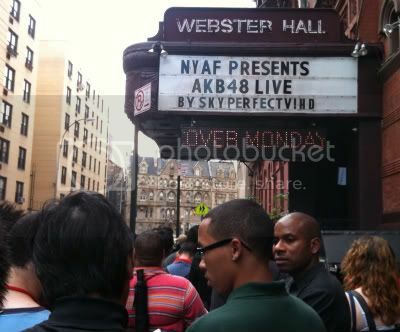 The AKB48 concert was lots of fun. Really loved those AKB48 girls. I’ll write more about the concert in my upcoming feature on the group, probably later next week. @Scott Amazing. I’m browsing YT for AKB48 videos at the same time as you. Bye nyaf friends old & new — I gots ta catch a plane. Thanx for the fun — let’s do it again next year! @Deb Aoki It was great seeing you again. @Erica Friedman yah! Sorry we didn’t have more time to chat — but always great to see you! Goodbye NYAF I had a wonderful time. Heading to Penn Station then JFK. Everyone safe travels home. Glad I took next 2 days off. is heading off to JFK! Thanx #NYAF. Now that manga is having less & less of a presence @ Anime cons, I think I can/should cut back my con sked next yr.
#NYAF was so much fun our flight has been delayed at JFK. #NYAF is officially over! Waiting on line for Megabus, which is now leaving an hour later than expected, apparently. A *half* hour. My bad. A whole hour would be torture. Coming down from my #NYAF high at Laguardia. Boy, I sure do love sitting in airports. done with #NYAF, see you at the new york comic anime con festival in oct 2010! @Deb Aoki Unfortunately United terminal is not nearly as nice. McD’s, sandwhich shop, Hudson News, etc. Very disappointed. So long, NYAF. Along with my last “In Tweets” report later today, I’ve got three features to write about in the upcoming Fridays. #NYAF 09 is over! Thank you! Thank you all for a great weekend! #NYAF is over and the huge amount of money that was in my wallet on Friday is all gone. Yay for spending money!! My #NYAF 2009 con swag: 5 art books, 2 DVD box sets and 1 figure. Technology hard at work in Washington-Dulles. As far as industry goes, my winner of NYAF this year was Vertical. I did an interview with @Ed Chavez, which I’ll post in a few weeks. I was also very happy to see Tokyopop at the con. I don’t remember the last time I saw them present at a con, but it’s been at least a year. But WHERE WAS YEN PRESS?! Yen Press was my winner of the past two New York Comic Cons. They’re an NYC company. WHERE WERE THEY?! Biggest disappointment? Bandai. And it’s a shame because Bandai owned Otakon just a few months ago. This entry was posted on Sunday, September 27th, 2009 at 10:11 pm by Scott	.